PHOTO: Allen Ramsey, DWCPhoto.com. 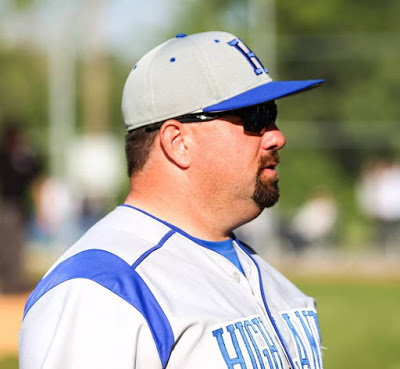 Highlands baseball Head Coach Jeremy Baioni and the Bluebirds will see more room in foul territory and behind the plate at Highland Park for home games this spring. The Fort Thomas community and school district has invested into upgrading the facilities lately and Highland Park is another example. The Highlands Bluebirds baseball team will notice more room behind home plate and in foul territory as both have been expanded for the season. Home plate is in the same spot. But the backstop was moved back 14 feet. "With the city and (Fort Thomas Independent School) district, we've had a great partnership the last few years with multiple facilities," said Jeremy Baioni, Highlands Head Coach. "This is just another example of that working really hard and working together to make sure our student-athletes have places they can really be proud of. That's just Fort Thomas. Whether it's athletics or academics, they're all in and very supportive. Ten years ago, it didn't seem like there was a ton of support. I don't necessarily blame the community or anything like that. But it's really neat to see now. They're really excited about baseball and some of the other sports." The expansion down the lines should benefit defenses because they will have more room to make plays on foul balls instead of going out of play like previous years. But Baioni said the base coaches will also see a huge benefit from the upgrades. "As the third base coach, we were standing six feet from the bag," Baioni said. "Now we have a ton of space. It's going to look a lot nicer. It looks more like a true baseball field." The bigger backstop will help runners take more bases on passed balls and wild pitches. Highlands has capitalized on wild pitches and passed balls in recent years including the last two that have produced consecutive 9th Region titles and a state runner-up finish in 2014. "It'll be a lot more beneficial to the runner because when it gets by, you don't have to worry as much about the catcher making a play off the backstop as much. They only had to take a few steps," said Brady Gosney, Highlands senior. "But I'm pretty sure now they're going to have to take a jog. It'll be a great experience for the players and the people who come watch the games because it will be more enjoyable." Defensively, senior Kyle Finfrock said the communication between the catchers and pitchers will be essential this year. Catchers have to react quickly to make sure balls do not get away. "Our catchers are great. I'm pretty confident in them," Finfrock said. "Even if we as pitchers do make a mistake, they're going to clean it up for us and help us out." Highlands scrimmages Conner at Highland Park at Noon on March 11. The Bluebirds then travel to Hebron to face the Cougars on March 21 at 5 p.m.